Has anyone made any data logs using torque pro? It's a great tool to figure out what the motor is doing and provides useful information when discussing performance or mods.. I for one am interested in the lowest vacuum, and what people are getting for timing advance, especially on different fuel octane (although temperature also plays into that). All you need is the Torque (pro) app for android, free for basic and a $5-10 ELM Bluetooth obd2 adapter from ebay. I could try to log some stuff but other than making sure the engine is working as it should what can we glean from the info? There is not a lot of performance support for this car. There is some interesting information you can gain from readouts. For example if you plot intake manifold Vacuum at WOT you can find out how restrictive filter/box/throttle is. Yea its not from a 3a92, but I just assumed the pressure hadn't been divided out. Actually its still wrong even after lol. Ill have to check I may have forgot to add something to vehicle profile used in the calculation. 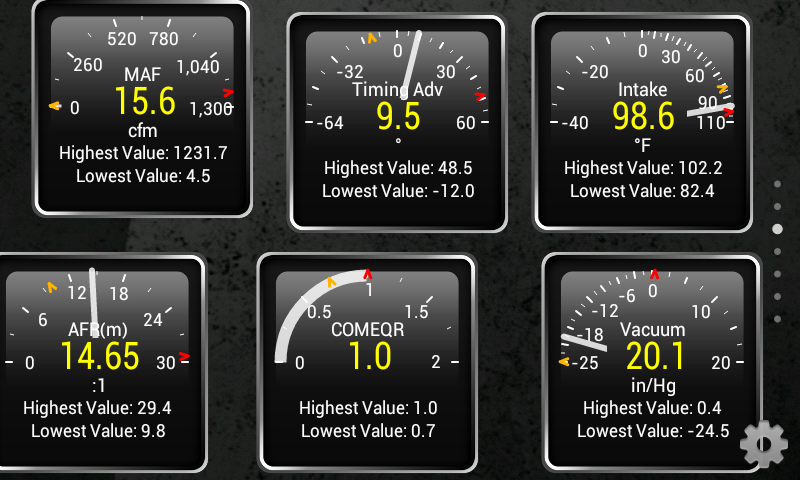 I just looked at the same display on a different (newer device and the MAF reading is correctly scaled. I don't know whatsup with that. Last edited by chris_top_her; 01-12-2016 at 05:05 PM. No Torque just has issues with cfm calculations. I have reported this to Ian a while back. Not sure why it is not fixed yet. I just remembered that the ECU controls throttle now, and probably never opens it up at 100%. With that said, will you still be able to figure out the statement above? What you care is plotting manifold vacuum, not the position of the throttle plate. I had done similar experiments on other cars and by removing snorkel and/or filter was able to figure out what intake updates are worth doing. For example on Prius C manifold vacuum is 1.2-1.6psi and removing filter reduced it by 0.6psi and snorkel was inconsequential. K&N replacement filter gave half ~0.3psi, so the improvement ~2%. The biggest difference that Prius ECU most of the time runs engine with low manifold vacuum, so 2% decrease in pumping losses will have affect across the board. On Mirage it will only have effect in high demand situations, so MPG gains will be very minimal. If you disconnect hose attached to airbox, you can figure out what is the delta, and the cold injection cone filter would likely have 0.2-0.3psi drop, so we can figure out what is the difference btw stock intake with OEM vs stock intake with K&N vs cold intake. Last edited by cyclopathic; 01-15-2016 at 04:21 PM. Anyone actually have the means to post a log? Lol. Has anybody using 88AKI/92RON gasoline tried to look at the ignition timing at idling speed? Also, for people using 94AKI/98RON grade? I am interested to know if the timing advance is the same. Would it be helpful to know the temperature of coolant and intake air? I would expect they would both have an impact on timing. By the way that looks like the OBDLink app.